This issue's article is by Osama Moh'd H. Bagersh who is an Instructor at the College of Education (Mathematics Department) / Aden University. Below is the Summary to his thesis for a master degree in Vedic Mathematics in the field of Mathematics Education. The results show that the Vedic methods seem significantly better than the conventional methods. The author hopes to take these studies further for his PhD. The effect of Vedic Method to perform multiplication and division on the achievement the pupils of the 5th grade in Aden. This study aimed to specify the effect of Vedic Method on the achievement of the pupils of the 5th grade in permanence of multiplication and division at Aden governorate. The sample was divided in to two groups: one control group and the other is the experimental group. Each group consisted of (35) boys and (44) girls. Before starting the school experiment the researcher made sure that the two group were equivalent for age, social environment and earlier achievement on basis of equivalent test. According to levels of achievements each group was divided into three sub-groups (high- middle- low). The researcher prepared a written instructional material (as experimental material), to teach the third unit of the mathematics syllabus in grade 5. This unit deals with multiplication and division. The pupils of experimental group were taught by using this experimental material, whereas the pupils of control group were taught by using the common (current) method. The experiment continued for four weeks, started by carrying out the equivalent test, and ended by carrying out the achievement test. 1. There is no significant difference in the achievement at the level of a = 0.05 between the marks averages of the pupils of the two groups: the experimental one which was taught by Vedic Method and the control group which was taught by common method. 2. There is no significant difference at the level of a = 0.05 between the marks averages in the achievement test of the boys pupils of the two groups, as well as of the girls pupils of the two groups..
3. There is no significant difference at the level of a = 0.05 between the marks averages in the achievement test of the pupils of the sub-groups (high, middle and low) of the two main group. After finishing the school experiment the hypothesis was examined by using t-test.
? for the whole two groups.
? for the boys groups.
? for the girls groups. · for the sub-groups of high and middle levels . b) There is no significant difference at the level of a = 0.05 between the marks overages in achievement test of the pupils of the sub-groups of low level . It is necessary to mention that the achievement levels are very low in general. 2- The school field experiments are faced with rejection from the school administrations; One of the reasons is that some of the teachers lose their private lesson when such experiment carried out then they couldn't follow the new methods. a administration, the teacher and subject's guidance. 2- To add some heritage and enrichment as well as skills to the course ''teaching methods'' at colleges of education and teachers' institutes. That should be also the training courses for in-services teachers. The expelled results are to develop qualification of teachers, their satisfaction and trends to renovation and experiment of new methods. 1- To carry out such a study using Vedic Method only for one of the two operations, either multiplication or division in a lower classes, that they acquired new knowledge and skills without previous impression as well they have enough time to learn this method. 2- To carry out such studies to perform other mathematical operations because the Vedic Method can be used in other branches of mathematics such as algebra and geometry. 3- To carry out some studies to animate the mathematical heritage (the Islamic, Arabic and international). During the visit to India described in the previous newsletter His Holiness Jagadguru Shankaracharya Swami Nishchalananda Saraswati ji of Govardhan Matha, Puri pointed out that documents and artifacts originally belonging to Bharati Krsna Tirthaji now belong at the Govardhan Matha. We were able at that time to pass on some original pages written by Bharati Krsna Tirthaji and would like to impress on anyone who has material of this kind to see it is returned. If anyone knows of the whereabouts of such material or would like to discuss this please contact . Dr. Brian Mc Enery lead researcher in The Centre for Natural Computation in Cork, Ireland, announces that he has launched a program to advance research on the foundation of Geometry based on the perspectives of Vedic Geometry, Tensor Calculus, and Gaelic Computation. Anyone wishing to participate in the program should send an e-mail to . Put as the subject line 'Advance Research on Geometry'. A first draft of the initial research paper 'The Axiom of Dimensionality', should be available in 7 days. The primary topic from Vedic Geometry is the construction of a hyper-circle in Real-4 space. The primary area from Tensor Calculus is the construction of a rotation of a di-monad for ascending to, and descending from Real-4 space. The primary principle from Gaelic Computation is Roth Lugh. I gave a introduction talk in Indian School Muscat for the Senior teachers, where my daughter Amirthaa is studying. They are very much interested in that and told Amirthaa to give a demo in the School Assembly so that it'll reach other students also. And after that if any enquiries come I can put them on the classes. The principal, Achuthan Madhav of Indian School Muscat organised the workshop and he encouraged so much. If the principal of all the Schools encouraged like him, Vedic Maths will reach all the Schools. Let us hope for the best. Mr. K.S. Raman IS AVAILABLE FOR TUTORING Vedic Mathematics in Nagpur, India. Sumit Sharma, B.E.IV yr student, sends an interesting method of squaring any number. (Note:- Only where last digit is 5 or 0, middle term is divided by 10, otherwise there is no need to divide by 10 in formula in red color. Motilal Banarsidass are no longer the publishers of books on Vedic Mathematics written by Kenneth Williams, Mark Gaskell and Andrew Nicholas. These will be printed and published elsewhere in the future. 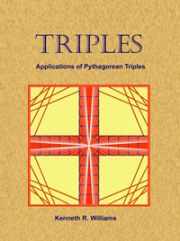 # If only I had known about them [triples] while I was doing my PhD, it would have made my work so much easier.